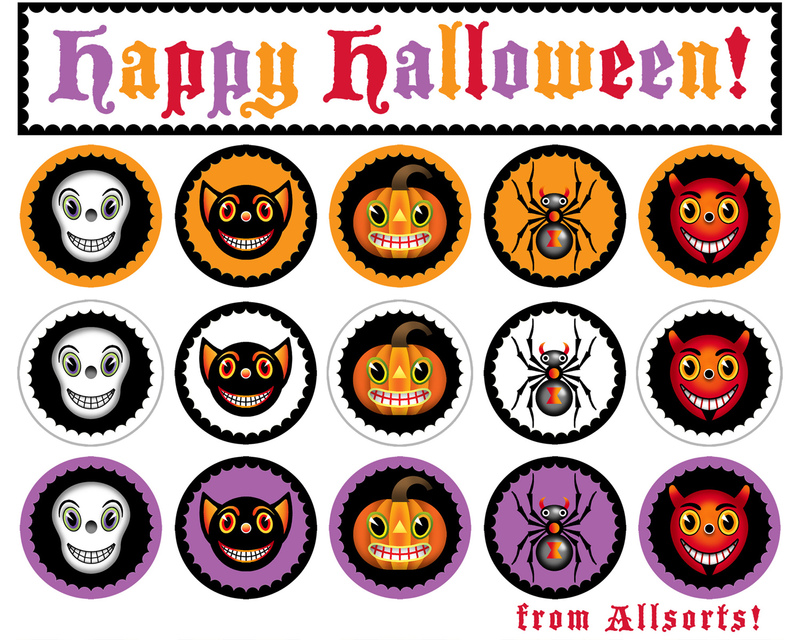 Did you notice some Halloweeny things happening to Allsorts today? My Zoe avatar donned a bee costume, and I tweaked the design of the blog a bit in honor of the spooky season. I consider Halloween to be the savory appetizer to the multi-course banquet of the holidays. It's a nice counterpoint to the visual feast of Christmas to come! But, on to the announcement. Remember how last year I created On Halloween as an interactive book for ITB? Well, I revamped the entire book, and now it is available as a free-standing app in iTunes! I added tons of interactions, and little Miss Zoe has two new costumes, a scarecrow and fortune teller. We also lowered the price to $1.99! Boo! ...I mean yay! Every page has new goodies... there are cute crows, cats, bats, spiders, ghosts and pumpkins galore that bounce, roll, dance... even moo! I hope kids will have as much fun playing with it as I had making it! I'd be thrilled if you check it out, and especially grateful if you spread the word about it. I put so much love into this and I'm tremendously honored that ITB decided to make it into a free-standing app. You can find it in iTunes by searching for "On Halloween" ~ or simply click -->here<--- And a big big thank you from the bottom of my heart! You kiddies be good now... I'll be back on Tuesday. Hope you have a splendid Halloween... don't eat too much chocolate! How's about a little freebie? I've used these guys for mini-garlands and as dangles on my spooky Halloween tree, but they'd be cute as cupcake toppers, too! Right-click the name below to download the jpg, then print on card stock or glossy photo paper and cut out. In other unrelated news, it finally turned cooler here, so I'm much more in the autumnal spirit. In a brief spurt of motivation, I rooted through the attic and wrestled down the boxes of Fall/Halloween decorations. Don't know how far I'll get in putting anything up, but at least I'm feeling more inspired!